All products benefit from a burning in/running in period of time. Phono stages used with analogue replay are no exception. 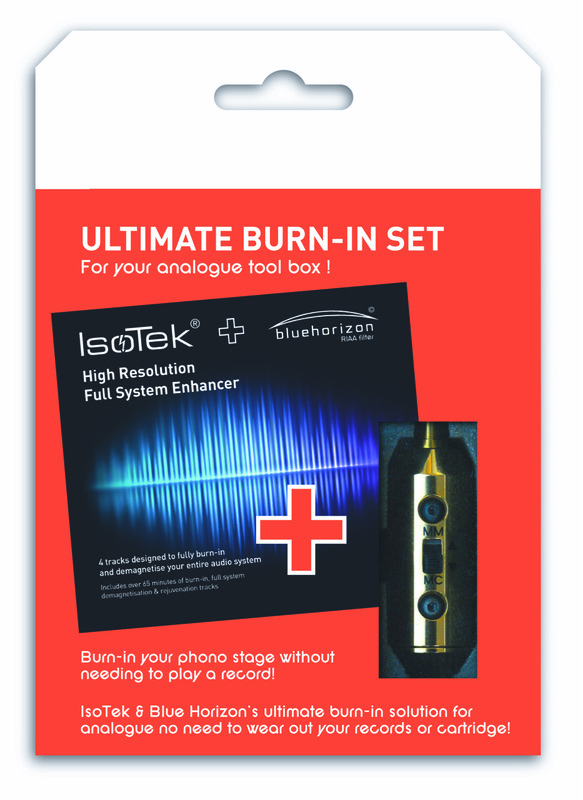 Blue Horizon has launched an integrated RIAA Filter with IsoTek High Resolution Full System Enhancer CD. The compact RIAA Filter allows you to directly connect your CD player to your phono stage and put CDs on repeat. Historically to optimise a phono stage new owners would need to play LP records for at least 72+ hours. This would require LP records to be played on turntable, causing record wear, cartridge wear and the need to turn the record over, approximately every 15 minutes. With the small yet effective Blue Horizon RIAA Filter you can now directly connect your CD player to your phono stage and put CDs on repeat. The most effective way however is to use this product in combination with the IsoTek Full System Enhancer CD that also features a dedicated Phono Stage burn-in track. Each channel can be conditioned independently giving great control and an easy performance boost. Easy selection between Moving Coil and Moving Magnet cartridge designs. Simply plug the Blue Horizon RIAA filter into the input sockets of your phono stage, and connect your CD player using standard RCA connectors and interconnect cable. Simple and effective. Each RIAA filter is supplied in full colour branded box packaging for easy display. The 4-track CD contains high and low frequency test tones, calibrated to a carefully designed mathematical algorithm to fully burn-in and demagnetise your audio or AV system. The High Resolution Full System Enhancer features four tracks designed to address burn-in and demagnetising of all audio hi-fi systems. The first two tracks can be used for all audio systems using CD as the source. The third track is specially designed to condition phono stages in a manner LPs simply can’t achieve (requires the use of an inverse RIAA filter, not included). Finally, the fourth track is designed to exercise the full dynamic range of 24-bit high-res music server system. Full System Burn-In and Demagnetisation Tracks. Track 3: (15 Minutes) requires the Blue Horizon RIAA Phono Burn-In box, not included. DO NOT connect your CD player directly to your phono stage, a suitable RIAA filter must be used. Track 4: Music Server Hi-Res Burn-In Demag (17.5 Minutes data track) Requires a computer. Designed for music server based audio. Blue Horizon is a design and manufacturing company specialising in professional-grade audio accessories based in Winchester England. Formed in 2008 by Keith Martin the founder and Managing Director of the IsoTek brand, his one goal is to create sound-enhancing accessories that enable audiophiles to achieve an even greater level of performance from their hi-fi system. Blue Horizon’s professional-grade, sound-enhancing accessories deliver class-leading performance as a result of innovative technology and meticulous design. These unique ideas are engineered to the highest possible standard and developed by a highly qualified, award-winning team with over 100 years combined experience in specialist audio.